I could write a really lengthy and detailed explanation of everywhere we ate and drank across Montreal. Instead of boring your pants off, I’ll make everything a list with hyperlinks. Smoked Meat Poutine at Schwartz Meats – so terrible we left. I don’t understand why there was a line out the door and down the block. I would NOT recommend this place, but if you must, go to the take out shop next door. You can order and there are seats at the back. FOODIE’S PARADISE/Grocery: La Vieille Europe. WONDERFUL grocery shop that carries the most spectacular collection of randomness. C looked at me and said, ‘Are you even sure we can take that back across the border?’ I sighed and put back half the stuff in my arms. THIS is the kind of place that I only allow myself to buy what I can carry. No shopping baskets/carts – if I can’t carry it, I can’t buy it. Random Vintage clothing shop selling Vegan food at a counter: Eva B. I bought a Veggie Pogo – imagine a corn dog, but made out of mashed black beans and nastiness. Then deep fry it and leave it to turn into a sodden, leaden, greasy thing. Now, try serving it with a little plastic tub of spicy mayo. I don’t think I could throw it away fast enough. Fairmont Bagel v. St-Viateur Bagels. Sweet dough, skinny bagels. C preferred the well-done onion from Fairmont. I thought the Rosemary bagel from St-Viateur’s main shop at 263 St-Viateur Oest was good. Overall? We prefer New York bagels best of all. Café Olimpico v. Club Social. Cafeé Olimpico felt like walking to a French speaking version of Cheers. I could totally see us whiling away several hours here. It was lovely! Club Social felt more…neighborhoody. It had families circling tables, it was darker and very cosy. Both made nice coffees. We also stopped in at Anatol. Spices beyond spices beyond spices – I wish we could bring spices across the border! What would one DO with Chickory Powder? 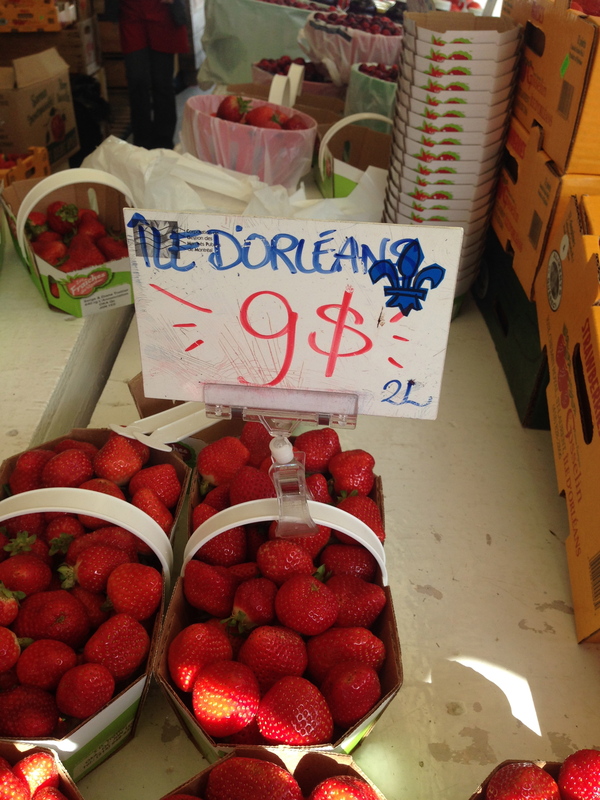 Marché Jean Talon – one of the BEST outdoor markets we’ve ever been to. The beauty, the plethora of fruit and vegetables, the COLORS! WOWOWOWOW. C looked at me and said, ‘You know something? If we had a market like this were we lived, we’d shop there every other day. We’d totally eat in season.’ He is so so right. Look at these BEAUTIFUL carrots! We sampled tiny little local strawberries and fruit I’ve never even heard of before – the Ground Cherry. Larger than a cranberry, smaller than a cherry. Sweet and tart at the same time. And SUCH raspberries! We found a market stall selling a basket of mixed fruit – BOUGHT IT. I also bought a pound of grapes just to snack on as we wandered around. *clapping* After wandering through the whole market, we decided to sit and have a coffee. 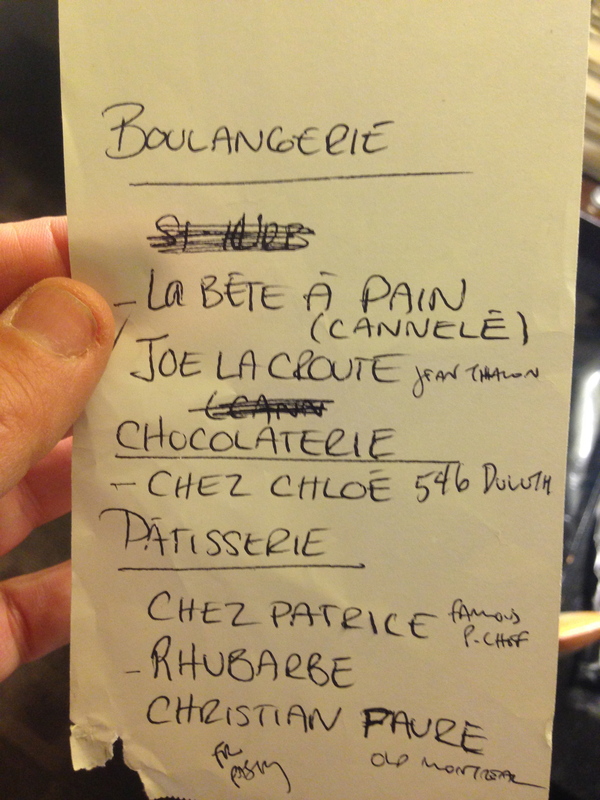 We picked a bakery on the outskirts of the market – Au Pain Doré. 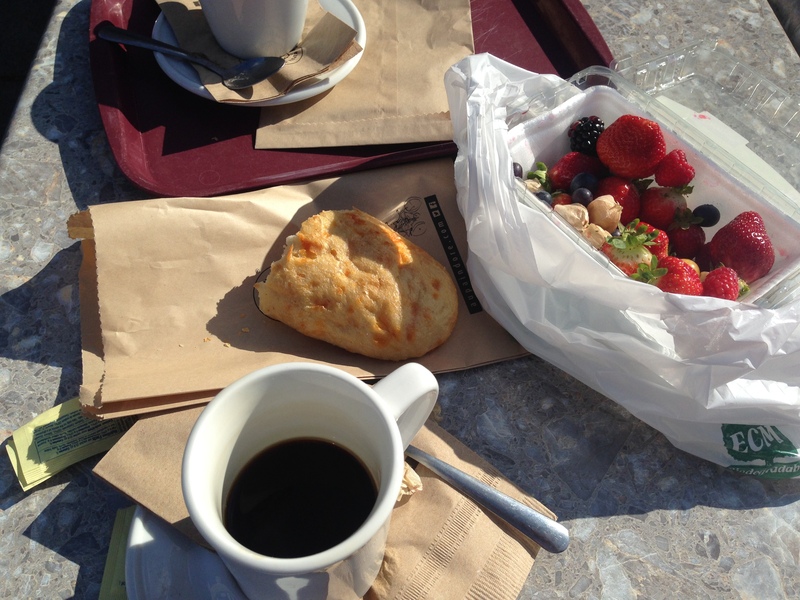 We got coffees and bread and sat in the sunshine. Much rejuvenated, we explored the shops on the outer ring of the market. The most BEAUTIFUL meats to be seen were at Boucherie Du Marché. Trussed quail stuffed with Raisins and Foie Gras, swirls of Ground Veal layered with Fresh Spinach and Dried Figs, Cornish Hens filled with Apricots and Brie – SO lovely! On the way out C picked up a couple of dried sausages to munch on. The next shop we wandered into was Boucherie Capitol. It was full of lovely cheeses and pastas – but C grew bored and decided to go back to Boucherie Du Marché to buy some more sausages for the trip home. This is what Montreal looks like! 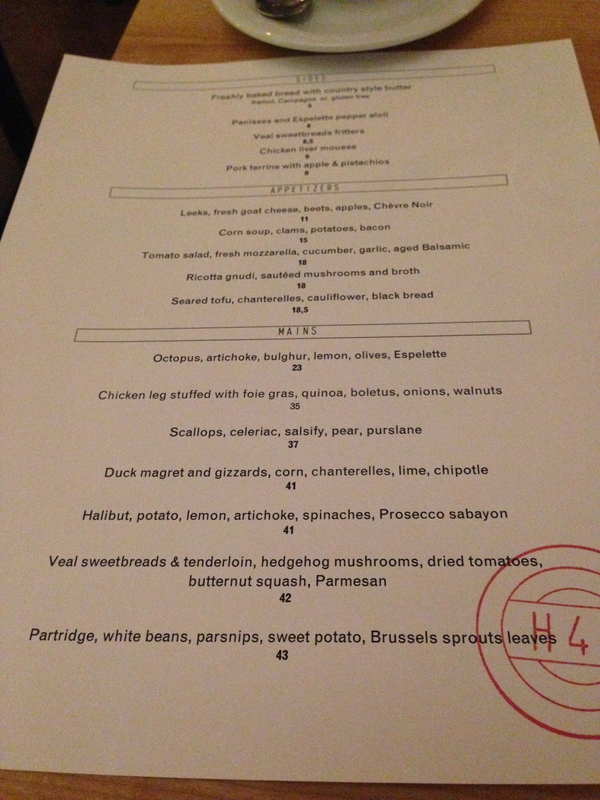 Dinner BLEW US AWAY: H4C. Frederíc & Andrea were the best servers! Their recommendations were SPOT.ON. From the wine through dessert – this place was SPECTACULAR. C started with the Sweetbread Fritters, then had the Corn soup with clams, potatoes and bacon. 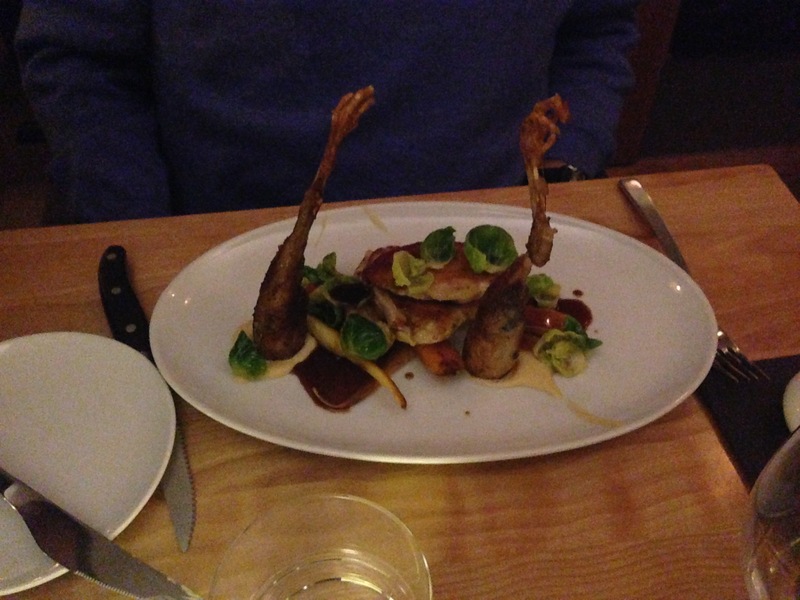 Next he had PARTRIDGE – which was served with the legs standing claws up. I couldn’t choose, so I had three appetizers for my meal. I started with the Leeks – they came stacked like coins, served with tiny cubes of beets and apples and two kinds of goat cheese. 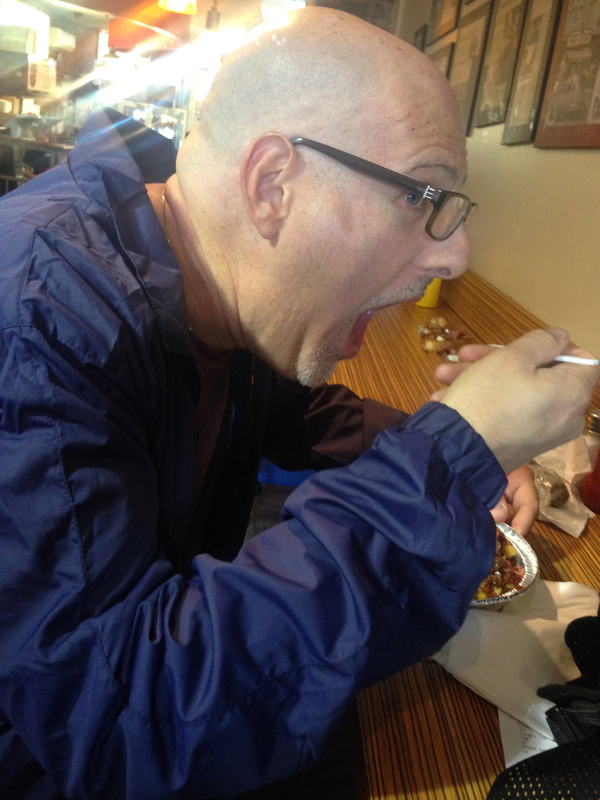 Next I had the Ricotta Gnudi – which are like ravioli without the pasta wrapping. It was served in such a lovely and light mushroom broth – I didn’t want to waste a single drop, so I ordered a loaf of freshly baked bread to sop it up. The waiter suggested the Kamut loaf (other options were Campagne and Gluten Free). Lastly, I had the Seared Tofu with Chanterelles, Cauliflower and Black Bread. 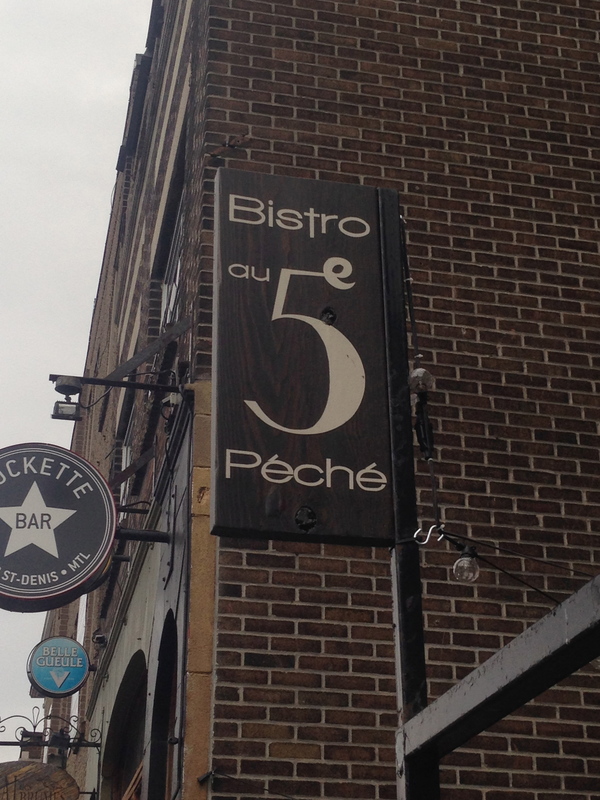 *much swooning to be had* THIS was the single best savory thing I ate in ALL OF MONTREAL. I pestered poor Frederíc for the recipe that he finally gave it to me. I loved this dish so much that I drew a picture of it, so I’ll be able to recreate at home. The slab of tofu (Frederíc even told me the name and location of the shop that makes it for them!) is coated in cornstarch and lightly fried – creating a warm creamy center and a lightly crispy exterior. There was a swath of sautéed mushrooms underneath, delicious little cauliflower florets sprinkled about and then – then! There were tiny little piles or crunchy buttery Black Bread Crumbs that were so absolutely PERFECT. This was the kind of dish one needs to eat with their eyes closed so as to allow all of the tastes to unfurl across the tongue. Can you see his BIG FAT GRIN? Turnover and a fresh Madeline. I had an Almond Croissant – DIVINE. It was so delicious that we bought more pastries to bring along with us. C picked up a Palmier (elephant ear) and I snagged both a tube of Fruit Geleés and a slice of Fruit Cake – which tasted like a pound cake studded with candied fruit that’d been soaked in rum? Amaretto? Delicious magic?? There is a pastry school upstairs and we saw several food tours start here too. When we strike it rich, I told C he should come back here for classes. Marché du Atwater – another outdoor market we visited. 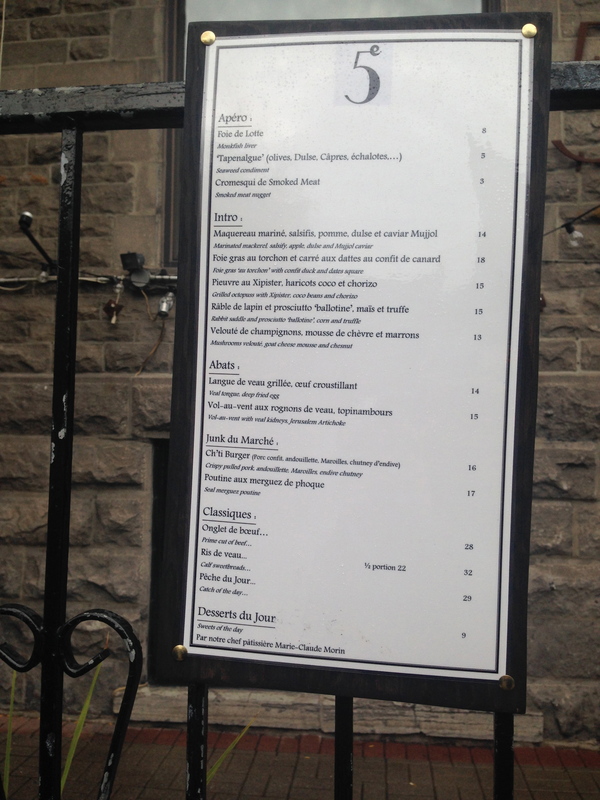 Smaller than Jean Talon, but greater variety of prepared meats and patés. C sampled some delicious ones! We also tried a local cheese that sorta looks like a stringy ball of mozzarella in brine – but it’s not. It’s chewy and very salty. No idea what it’s called. The lady at the checkout even gave C a packet of Prosciutto ends too. SUPER NICE!! Wonder what these’d taste like? She’s using a REAL basket!! Doesn’t it look like mozzarella? It’s not. We tasted and explored all the way through the market, then I dragged C into the big supermarket next door – I love love love exploring markets all over the place. Seeing colors, flavor combinations, packaging – love it! Mae Wests and Joe Louis?? Time for Breakfast #2: THE BEST PATISSERIE – Rhubarbe. C had a pastry that was light and crispy and filled with this wonderful lemon custard and a coffee. I had a Dacquoise of Pistache and Pamplemousse. It was so so SO remarkable that I went up to the counter to shake the hand of the people who’d created it. I have never – NEVER – had anything so amazing as this. never. It was a layer of light pistachio cake studded with chopped nuts. Next was a thin layer of what I think is called Praliné Feulletine – praliné paste mixed with crispy cracker crumbs. This was topped with this..ethereal and perfect layer of was it sweetened whipped cream? No. Something more. Something…I couldn’t put my finger on it. I asked the lady behind the counter (the owner?) what was in the cream – honey? sugar? maple? agave? What was it? She smiled – they add in drops of fresh grapefruit juice, a tiny bit of Campari, and a teensy little bit of grapefruit bitters. It was AAAAAMMMMAAAAAYYYZZIIIIIIINGGGG. We went to walk off both breakfasts – on the way to lunch, of course! 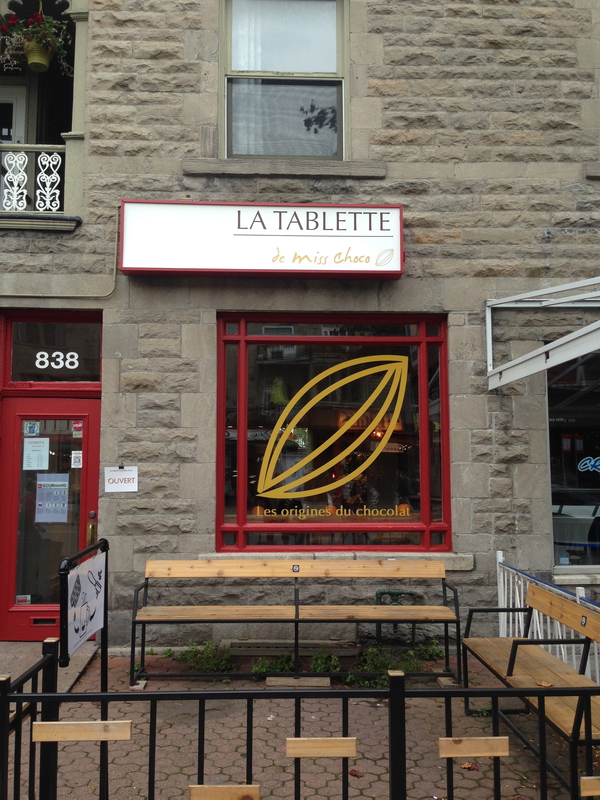 We wandered through the Plateau Mont Royal neighborhood and came across a great Chocolate Shop – La Tablette. They specialize in bean-to-bar chocolatiers from around the world. The owners are SUPER NICE and they insist on you tasting everything too. We, obviously, came away with an ENTIRE BAG full of new chocolate bars to try. They even gave us a suggestion for where to buy C a hat (he forgot his at home). Lunch was POUTINE: La Banquise. Poutine is french fries topped with fresh cheese curds and smothered with gravy – total comfort food. I picked this restaurant because it was on at least 4 Places-to-eat-in-Montreal lists, its open 24 hours, and it has both VEGETARIAN and VEGAN versions of poutines! YAHOOO!!! C had La T-Rex = tons of meat. I had La Rachel with Vegetarian Sauce (it had a lovely fennel flavor) and without Green Peppers. It was YUMMY! We ate this with a couple of local beers – nice! As we sat in the window, we had prime viewing of local costumes! We also got to watch people filming a movie just outside the restaurant. C made faces in the background. He’s so classy. Breakfast at L’Avenue. Turns out, we’d walked by this place the day before – the line was out the door and down the block. Literally. When we got here at 8/8:30a on Sunday there was no line, and we were seated immediately. We asked our waiter why the place was so famous and he explained that the restaurant was known for three things: Their eggs benedict with fresh hollandaise, their french toast, and their fruit drinks – like a fruit smoothie. We were both interested in the eggs benedict – C with meat, me without. LOVELY. We decided to share the fruit smoothie made with strawberries, raspberries, litchis, basil and fresh mint. SO GOOD!!! Our fruity drink – it’s HUGE and so so good! The coolest thing though, was the BATHROOM. In the blacklist, graffittied bathroom was a clock – and not just ANY clock. This was a video of a clock – but it’s really an artist standing behind a frosted glass with the numbers of the clock written on it in black sharpie. The artist was standing there, drawing in the hands of the clock, pausing, then erasing the hand and RE-DRAWING IT for the next minute! SO FREAKIN’ COOL!!!! So so so cool! I need an artist friend who will be making me this video clock for my birthday/Chanukah/because they love me. Can you see the clock?? End Result: The people are lovely and kind, the food was SO DIVERSE and delicious, the city was just lovely. I really REALLY enjoyed this visit! After breakfast we wandered around some more – we stumbled upon a marathon & a park and then headed down to see the gay part of town (our waiter suggested we go as it’s ‘the fun part of the city’). All the cop cars had these stickers on them…? You should visit random toy stores too. This was our favorite: Le Jolie Boutique. C’s favorite? The Playmobil Armed Robbery play set. It’s part of their City Living Series.